Tibetan Pigs, from the Qinghai-Tibet Plateau, are especially adapted to the high, cold climate and to being on pasture all year round. Their meat has a marble appearance and meat with a special flavor. Tibetan Pigs are not very heavy (about 35 kg in mature animals.). They are known to be very alert -often running and jumping, with quick responses for guarding against attack from other animals.They have a narrow head and a long straight snout, to facilitate searching for feeds under the ground. 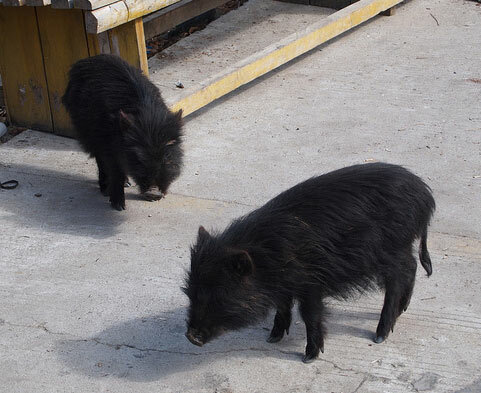 They have a black hair coat, with long and dense bristles (length 12 cm, about 2 to 3 times longer than other breeds) which protect it from the three times as dense as in Sichuan native pigs) which protect it from the strong solar radiation of ultra-violet rays and also from the cold weather on the plateau. Tibetan Pigshave highly developed digestive organs; the length of the intestine is about 36 times its own body length .This is presumably a mechanism responsible for the pig's ability to utilize shrubs as feed, as well as the stems, roots and hard seeds of wild plants. They also have an excellent ability to deposit fat in the body - their internal and visceral fat is about 15 percent of bodyweight (for other pig breeds, 7 to 10 percent).